Its turning out to be an eventful 2014. Now as little as I update my blog, many must assume that: A) I am the laziest human being on earth, B) I hate all forms of social media, or C) I am insanely busy. While “B” would be a very good guess, “C” is actually the primary reason that my blog has been neglected. I have been extremely busy working on a slue of feature film projects (animated and live action), television shows, books, and even some incredible Theme Park projects. I have been able to contribute in numerous ways to each, and have collaborated with some absolutely amazing people along the way. Many of these projects I can not share yet, and some things I may never be able to share, but in the upcoming months there are several projects I had the pleasure of being involved with, that are being released to the world: The LEGO MOVIE, Mr. PEABODY & SHERMAN, and a children’s picture book titled “PLANET KINDERGARTEN”. I’ll be sharing a bit about my involvement with each over the next several months, so it will be nice to feed my emaciated blog once again. Stay posted. Last night I, along with my fellow designers Carter Goodrich and Takao Noguchi, won the ANNIE AWARD for "Outstanding Achievement in Character Design for a Feature Production" for our work on Dreamworks animation's the CROODS. 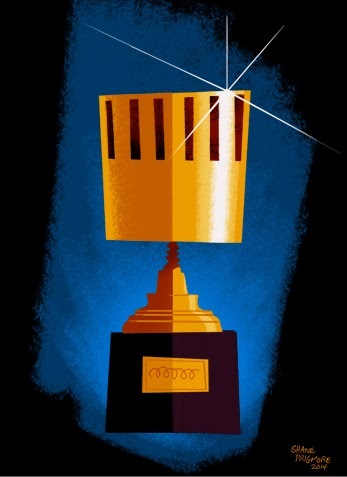 This is my second Annie Award (and second nomination), and I am incredibly grateful and honored to have been considered alongside all of the amazingly talented nominees once again. 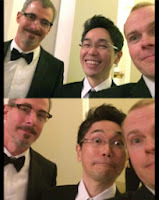 Below is a quick backstage snapshot(From left to right: Carter, Takao, and me). A huge thank you for all of the kind congratulatory messages from friends, family, colleagues and strangers from around the world. I am honored to have even received a congrats in Klingon (Thanks Shawn Keller). All forms of well wishes have been much appreciated. Thank you.